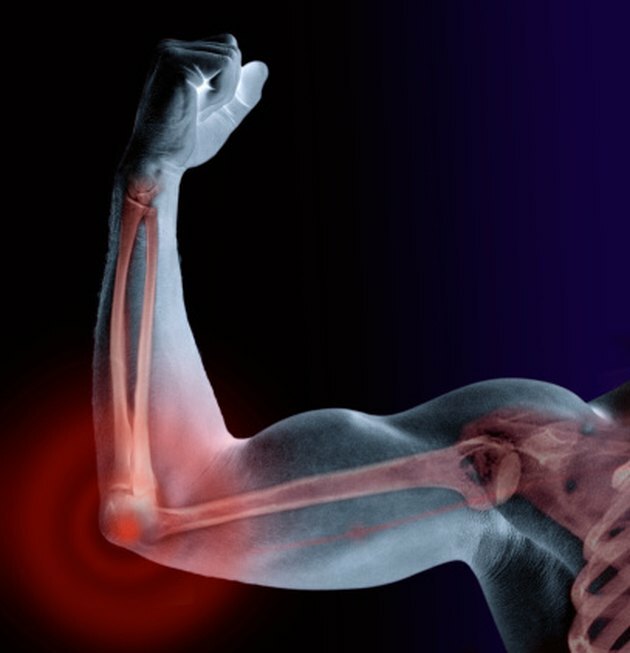 What are the Causes of Arm Muscle Fatigue? Muscle fatigue occurs when the muscle experiences a reduction in its ability to produce voluntary movements or perform repetitive actions, notes Biology Online. All muscles in the body can experience muscle fatigue, including your arms, but muscle fatigue has numerous causes and therefore different routes for relief. Understanding the culprit behind your muscle fatigue will help you reach relief quickly. Fibromyalgia is a condition marked by widespread muscle fatigue in multiple parts of your body, including the arms. Fibromyalgia also can cause pain in these areas upon applying slight pressure to tender points, which include the shoulders and outsides of the elbows. Accompanying symptoms include headaches, arthritis, depression and post-traumatic stress syndrome. To treat the condition, your doctor might recommend certain medications and self-care, such as therapy. A repetitive stress injury is caused by overuse of the forearm extensor muscle, located in the upper forearm region. You use this muscle to raise your wrist and fingers -- the primary movement in operating a computer mouse and keyboard. However, you can experience RSI from any overuse of this muscle. Symptoms include a fatigued state and pain that extends into the hands and fingers. Massage, ice and rest can eliminate these feelings, notes the Ergomatters site. In addition, if your RSI comes from computer-related movements, simply changing the movements might relieve symptoms. In fact, not changing them might move your fatigue into a more permanent state that can be hard to remedy. Talk to your doctor about how to fix your computer-operating technique. Multiple sclerosis is a disease in which your immune system eats away at the protective covering on your nerves, which can interfere with communication between the brain and the body. Symptoms, therefore, depend on the areas of the body that have been affected by such deterioration of the protective sheath. Common symptoms of MS include fatigue and numbness or weakness in one or more limbs. Accompanying symptoms include dizziness, loss or blurriness of vision and tingling or pain in areas of the body. There is no cure for MS, but strategies to treat symptoms and modify the course of the disease are available. Talk to your doctor. Your arm muscle fatigue might be caused by other conditions not listed. To determine proper diagnosis, talk to your doctor. Relay your accompanying physical symptoms to increase the accuracy of the diagnosis. In addition, relay any emotional or mental symptoms you experience or have been diagnosed with, such as depression or PTSD. As with fibromyalgia, these can be indicators of a certain condition. What Causes Pins & Needles in the Arms While Playing Sports? Why Are My Arms Shaking Post Workout?